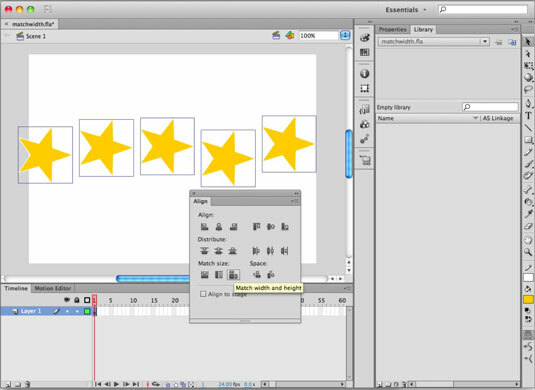 If you need to resize two or more objects on the Adobe Flash CS6 stage so that they’re all the same width and height, you can take advantage of the Match Size options in the Align panel. Match Size options can conform two objects to the same width or height, or both. Select two or more different-size graphics, symbols, or drawing objects on the stage. Choose Window→Align to launch the Align panel (if it’s not already open). If it’s selected, deselect the Align to Stage check box at the bottom of the Align panel. Locate the Match Size button group on the bottom of the panel and click the last button of the three (Match Width and Height). The objects resize to the same width and height. You can also match only width or height by clicking either the first or second buttons of the group, respectively. With the Stage button enabled, Match Size resizes any selected objects to the full width and height of your stage. Using this feature is an easy way to create a full-size background or to stretch a graphic to fit the entire stage. When you use Match Size, the largest of the selected objects always dictates the resizing. All other objects are resized to match the largest selected object.